Why college friends Kurt Rossner and Adrian Szamreta launched Old Smoke Clothing Co.
Old Smoke Clothing Co. founders Adrian Szamreta and Kurt Rossner wanted to give a subtle creative nod to the history of horse racing rooted in Saratoga Springs. When I was growing up, my mother used to wear a white T-shirt with black velvet bubble letters on it that read, “Roses are red, violets are blue, I’m a schizophrenic and so am I.” She thought it was quite the knee-slapper. Though hardly PC, back then, the sight of her wearing it out in public always got a chuckle. T-shirts are the most basic, yet universally impactful, fashion statement. The ones you choose to wear give others clues about your personal style, sense of humor (in my mom’s case) and interests. 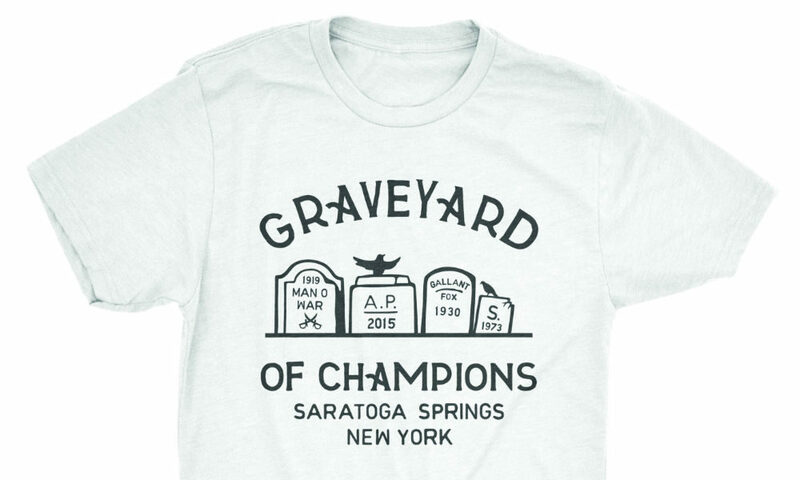 So when college buddies and Saratoga Springs horse-racing fanatics Kurt Rossner and Adrian Szamreta had the idea to create clothing for fellow racing junkies, it’s no wonder they settled on the beloved wardrobe staple as the backbone of their brand. At first, the friends determined to create high-end, designer duds suitable for a refined day at the track. But a brainstorming session over some beers and a flurry of sketches on cocktail napkins changed their direction. “The idea was to create a brand that horse-racing fans could relate to,” Rossner explains. “We thought it made sense to go after the lion’s share of racing attendees who weren’t dressed up!” And with that, Old Smoke Clothing Co. was born. With the company, the pair sought to give a subtle creative nod to the history of horse racing rooted in Saratoga culture. Rossner and Szamreta are motivated by history and symbolism—so much so that the company’s name, Old Smoke, hat-tips the nickname of Saratoga Race Course’s Cofounder, John Morrissey. Among the company’s most popular is their canoe shirt. “It’s such a great story, and 99 percent of people don’t know it,” says Rossner. Since 1962, it’s been the tradition to paint the canoe in the infield lake at Saratoga Race Course in the colors of the owner whose horse wins the Travers Stakes. “It’s such a cool graphic,” says Rossner. “And the history resonates.” I’m sure my mother would love it. Rosie Case is a freelance writer based in Fort Worth, TX. She's been writing for saratoga living since our 2018 Design Issue.